Place frozen spinach into a microwave safe bowl and cook on HIGH (100%) for 3 minutes before setting aside. Steam or microwave pumpkin with a bit of water for 10-15 minutes until tender. Squeeze handfuls of cooked spinach to remove excess liquid and add to a large bowl with garlic and ricotta or cottage cheese. Drain and mash cooked pumpkin. Add pumpkin to cheese spinach mixture and stir to combine. Spread 1/3 cup of tinned tomatoes over the base of a large 3cm deep rectangular 20x30cm ovenproof dish. Spoon 1/3 cup of pumpkin mixture lengthways into the middle of each lasagne sheet and roll up to enclose. 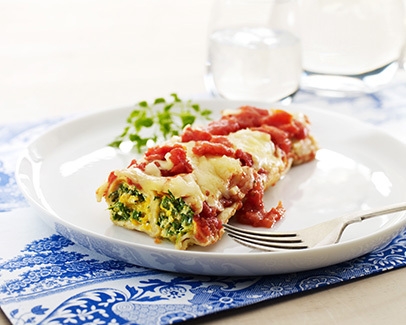 Arrange cannelloni in a single layer close together seam side down in the dish. Sprinkle with basil, spread over remaining tomatoes and top with cheese. Bake for 15 minutes, cover with foil to prevent burning and cook for a further 15 minutes or until tender.